For more than 25 years I have been studying and working with people and plants in the field of herbal medicine. I provide health and wellness consultations with clients and use preparations made from whole plants to promote health, wellness and vitality. My consulting practice is based in the east end of Toronto, Ontario and I also meet with clients when in Halifax, Nova Scotia. Outside of my clinical practice, I teach about sustainable, ethical and safe practices for using medicinal plants. My course offerings in herbal medicine include wild plant walks, herbal medicine workshops and intensive herbal training courses. I am always delighted to be invited to speak at public events about plant medicine. My work as an educator includes the development of curricula for herbal studies, I write articles related to plant medicine and I mentor and supervise herbal students through my affiliation with the International College of Herbal Medicine (ICOHM). I am passionate about the plant world and I love to dig in the earth and grow beautiful edible gardens – on the ground, on balconies and on rooftops. I teach people how to cultivate their own gardens and offer collaborative design sessions for those who want plants in their surroundings for food, medicine and pollinators. All my garden designs have a handbook with information about the plants and recipes for herbal medicines. I am a Registered Herbalist with the Ontario Herbalists Association (OHA) – the regulatory body for professional herbalists in Ontario. OHA Registered Herbalists are specialists in medicinal plants and their therapeutic uses and we are also required to meet rigorous educational and professional standards. 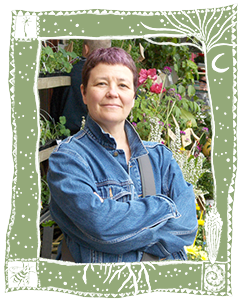 I am also a founding professional member of the Herbalist Association of Nova Scotia (HANS), a member of the Canadian Council of Herbalist Associations (CCHA), and a member of the American Herbalist Guild (AHG).